Thursday night was a big night for Nashville’s startup community. New online publication Southern Alpha, which covers high growth technology for the south east, held their inaugural Spark Nashville event. The event organized by Southern Alpha Marketing Director, Kelley Boothe and Editor in Chief, Walker Duncan, was a huge success. Spark Nashville consisted of three main parts, a fire side chat with Duncan, a pitch contest for Tennessee startups and time for networking in a startup exhibition. 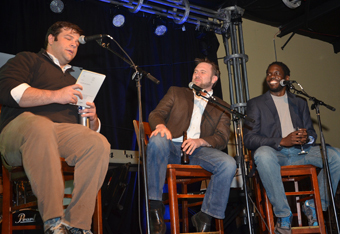 For this first event, Duncan had a fireside chat with community leaders Nick Holland and Marcus Whitney. Both men are seasoned entrepreneurs who’ve had measurable success with their own startups to date. Holland was the founder of what is now one of the biggest agencies in Nashville CentreSource and Whitney began his career with Emma and eventually spun off and cofounded MoonToast, a social agency that has clients as big as Universal Music Group. Whitney was named the CTO of the year this year by the Nashville Technology Council. Duncan had come up with some great questions for both guests who are now frequent mentors and advisors to budding young startups in the Nashville community. Holland has an open door policy with all entrepreneurs, a recognizable figure that stops and chats with anyone with an idea. Whitney is a managing director at JumpStart Foundry and a regular, accessible face at community events, as well as at the Entrepreneur Center. While both guests talked about the struggle and how hard it is to start your own business, they also both talked about the importance of peer groups and finding people to say yes. Sure every entrepreneur wants to find the people that say yes, “yes we’ll write you a check”, “yes your idea is great”, “Yes we can sponsor you”. As you’ll see in the video it’s actually an important foundation in a successful startup community. Both Holland and Whitney acknowledged that once you go out and prove yourself, roll up your sleeves and prove you’re not afraid to work hard, and not afraid to try, the yes’s get easier. Holland likes to steer clear of negativity and people who resort to no rather than to hear an idea out. When someone pitches Holland on an idea for a project or an event, if he can wrap his head around it he’s looking for ways to say yes and get it moving rather than to say no. “When I get inspired by somebody it’s infectious and I do whatever I can to say yes”. Early on in the video Whitney talks about his first experience pitching Holland. Nick had already had some success with CenterSource and Whitney was about to embark on the first BarCamp event, he went to Holland for $1,000 to sponsor. Whitney was a scrappy young and hungry entrepreneur with a great idea, and Holland said yes. The duo have worked together to help bring Startup Weekend to Nashville as well. They also both support just about any cause or event that’s good for the startup community. When startup community leaders are this supportive it is infectious and the community builds.. wait for it.. organically.